“Versatility," "adaptability" and "accessibility” are three words James Bringe, dairy equipment consultant for GEA Farm Technologies, uses to describe his company’s newest activity monitoring system. 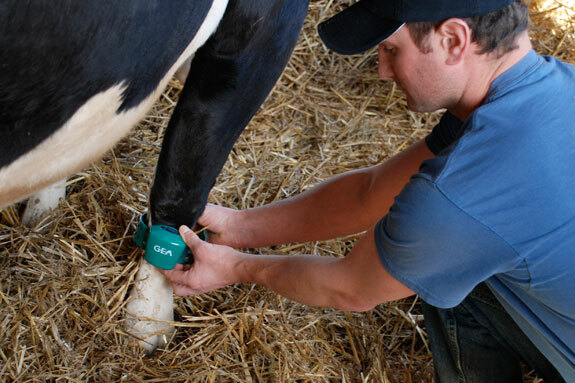 In early April, GEA Farm Technologies launched CowScout S, the company’s latest generation of heat detection technology. Unlike other systems, the CowScout S system stores the data that it collects using cloud technology, making it accessible to the producer at any time and anywhere. Bringe explains that the development of this system emerged after the company noticed the need for a stand-alone system – one that was not linked to a parlor-based milk metering or identification system. With 20 to 24 systems currently installed or in the process of being installed, Bringe adds that producers are beginning to see the benefits of this new technology. The system is composed of activity tags, a long-range antenna, a receiver or controller, a power supply and the system’s software program. The main function of the tag is to basically collect and store the cow’s activity data. The antenna sends out a signal, which energizes the tag prompting it to send the data collected back to the antenna, Bringe says. Once the data from the tag reaches the antenna, it is transmitted to the receiver. The receiver then sends the information to an internet-based herd database, which is the landing spot for the herd’s activity data. 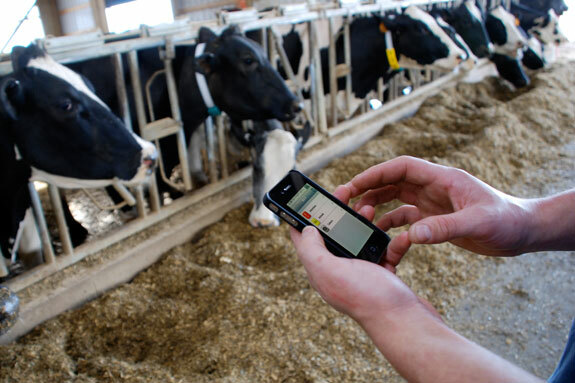 The web interface developed for the system allows producers to log in and access their herd’s activity data from any farm computer, smart phone or other mobile devices via an Internet connection. Similar to the company’s conventional system, this system analyzes and displays a cow’s activity in two-hour intervals. In order to establish an individualized baseline, the cow’s activity during one period is compared to her activity in the same period over the preceding days. 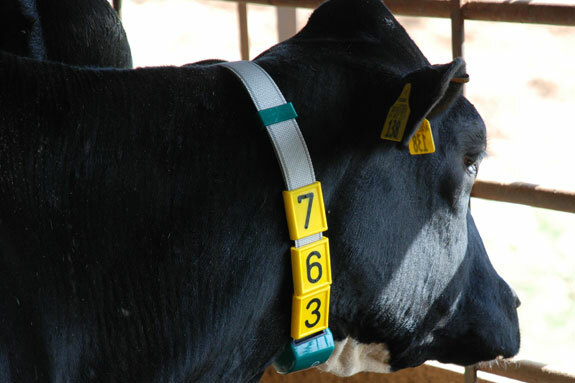 After the tag is placed on a cow, the system takes up to 10 days to establish an accurate baseline of an individual cow. At this point, the system will be able to determine high and low deviations from the cow’s baseline. Additionally, producers can customize the system’s sensitivity levels to fit their operations. Attention notifications are generated within the system if an animal’s activity levels increase sufficiently to cross her activity threshold or if it drops notably over several consecutive two-hour periods. If a suspicious increase or decrease in the cow’s activity occurs, but not enough to warrant an attention notification, an alert notification is sent instead. For example, when an animal is in peak heat, the activity levels increase and the tag sends a signal to the wireless receiver. The receiver then notifies the herd database, identifying the cows that are active. In turn, the database sends a message to the computer, a mobile device or both depending on the method of delivery chosen by the producer. Bringe states that not all producers access their herd’s data via an internet connection on mobile devices, but this does come in handy for breeding technicians or herdsmen that need to have that information readily available. The CowScout system’s tag uses accelerometer technology to detect a cow’s activity, as well as the sealed battery unit that the company has used in the past. The tag itself can also store information for up to 24 hours. Although only leg tags are currently available, Bringe explains that a neck version of the tag should be available by the end of the year. The system also uses ultra high frequency (UHF) wireless technology to secure a read range of up to 300 feet or the approximate length of a football field. The technology allows signals to be sent from the tag to the long-range antenna to the receiver wirelessly. In addition to being able to transmit information over a long distance, UHF technology provides an advantage over systems that rely on infrared technology to transfer data. Bringe explains that infrared technology requires a visible line of sight in order to transmit the data, which can become obstructed by dirt, manure or even signal interferences caused by the facility’s building components. The base price for the standard system is approximately $8,000, which consists of the antenna, controller, power supply and software, and usually includes the installation fees. The cost of the tags is then added to the base price at $85 per tag. Because the tags are transferrable, the producer ultimately decides on the amount of tags to purchase. However, having a tag on every animal reduces the amount of labor required in transferring tags from one cow to another. “The amount of tags the producer purchases will really depend on each producer’s reproductive program,” Bringe says. Four areas in which these activity systems benefit operations are a reduction in labor requirements, increased pregnancy rates, decrease in days open and a reduction in the usage of hormones. Dairies that follow sync programs to breed cows notice a reduction in reproductive hormone usage and labor costs. “As producers become confident with the system and see an increase in the percentage of natural heats detected, they begin to lower their usage of hormone therapy,” Bringe says. Additionally, the system can be used in freestall and pasture-based housing settings and isn’t limited to being used for dairy cows only. Heifer-raising operations can also benefit from using this system. Although the system is fully stand-alone and does not interfere or require integration with the dairy’s existing herd management software program, this is an area where Bringe says to have received some feedback from producers. TOP RIGHT: The CowScout S system's activity tags measure and collect the cow's activity data, with the capacity to store up to 24 hours of information. MIDDLE RIGHT: This activity monitoring system by GEA Farm Technologies uses cloud computing technology to store a herd's activity data in an internet-based database. BOTTOM RIGHT: Although the current activity tags are only available as leg units, a neck-mounted version of the tag will be available by the end of the year.